Two of the many things I worried about when I was setting up this blog were grammar and punctuation. They have never been my strong points. Regular readers my regular reader (Hello Mum) will undoubtedly have spotted enough errors to keep a gaggle of grammarians and a myriad of punctuation sticklers spluttering for hours. 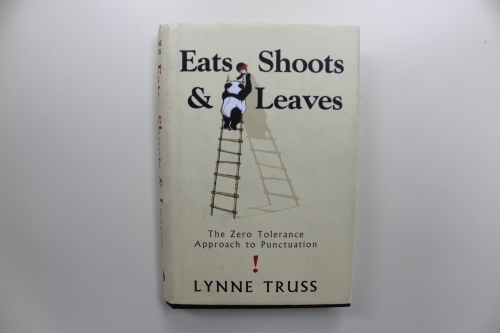 To help me on the punctuation front I have referred to Lynne Truss’s Eats Shoots & Leaves. (Christ on a gondola I wish I hadn’t started writing this post as I had to go to look up the apostrophe rule for the possessive of proper names ending in s). Anyway Lynne’s book is excellent and I am beginning to reacquaint myself with some of the punctuation rules I learnt at school and have blithely spent half a lifetime forgetting. That said, commas are one of the things that defeat me. Where commas are concerned I have developed a dual approach; posts are either liberally bedecked with the curly punctuation mark or are left comma free. I take some comfort in the fact that the use of the comma is often a matter of style and not rule. Now if I ruled the world for a day as well as making reading of my blog compulsory I might consider abolishing the comma. Would you miss the comma? I, on the other hand, am terrifically fond of the comma. It, in addition to so many other punctuation marks, helps the reader envision your comments as if you were speaking them. That said, I must confess that I had a particularly rigid 8th grade grammar teacher and she did an admirable job of banging all manner of grammar rules into our impressionable heads. Barring a year with Sr. Peter Maria, I can’t think of a more enjoyable way to review and learn grammar than by using Eats, Shoots & Leaves. Really enjoy your blog! Thanks so much for your comment Chris. Sounds like Sr. Peter Maria was an excellent teacher. One of the things I believe is that we are very lucky if we meet a few inspiring teachers as we navigate our passage through life.